The Synapse features updated SAVE Micro-Suspension flex zones in the rear triangle and fork to keep you comfortable and in control. SmartForm C2 Alloy Construction and new full carbon forks deliver exceptionally light weight for this category for a high-performance feel. With clearance for tyres up to 32mm wide, and subtle rack and mudguard mounts, the Synapse is ready for back-road exploring, group rides, fast commutes and anything in between. 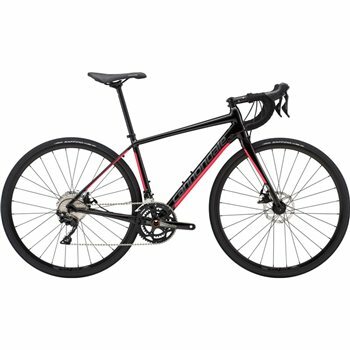 Frame: Synapse Disc Women's Asymmetric, SmartForm C2 Alloy, SAVE, BB30. Fork: Synapse Disc Women’s Asymmetric, Full Carbon, 1-1/8”- 1-1/4” tapered steerer, flat mount, 55mm rake, 12x100 thru-axle. Crank: FSA Gossamer Alloy, BB30, 50/34. Brakes: Tektro Spyre-C cable actuated disc, 160/160mm. Saddle: Cannondale Stage Ergo Women's.